Think of Indian street food and the first dish that comes to mind is crispy and crunchy samosa with delicious and spicy filling that bursts in the mouth with every bite. 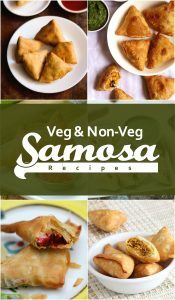 Samosa is a popular Indian snack that is prepared by deep frying or baking the triangular flour patties that are stuffed with savory filling such as potatoes and peas, lentils, onions, minced lamb, mutton, chicken and fish. Crispy samosa and masala chai make a wonderful combination, but samosas are also served with green mint chutney or tangy tamarind chutney. Samosa is available in almost all parts of India, and each region has its own authentic style of preparing the snack. Although, many of us shun this traditional snack is an unhealthy, calorie-rich junk food but home-made samosas can definitely be healthier if you want them to be. It is said that all good things come in small packages and it holds absolutely true for these soft, fluffy and flavorful steamed finger foods. Whatever name you address them with – momo, dumplings, dim sum or wontons, they taste purely delightful. Dumplings have their origin in Chinese cuisine and Chinese dumplings are prepared by filling the dough skin with chicken, meat, fish, shrimps and vegetables and then steamed in a special utensil made with bamboo. The dumplings can be pan-fired or deep-fired after being steamed. Momo is a Tibetan version of the Chinese dumplings that is widely popular in Nepal, Sikkim and Bhutan. Momo is prepared in a similar way like dumplings and served with a red chilli-garlic sauce and clear soup. 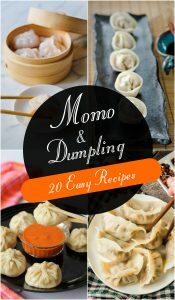 Steamed momos and dumplings make a healthy snack because they are much lower in calories and fat compared to other fast foods. Our lives are getting busier with each and every passing day and we are spending less and less time without family at the dinner table. Our dependence on packed and ready-to-eat meals is increasing and with it is increasing the risk of chronic diseases and obesity. So what is the way out of this vicious cycle? Well, the solution lies in quick and easy meals and snacks that you can prepare within a few minutes. A healthy meal doesn’t always have to be an elaborate and time-taking affair that takes up half the day. You can eat healthy and still save time if you know a few quick and easy meal and snacks recipes that can be prepared in 15 minutes or less. Just, try to use fresh produce and whole foods such as vegetables, fruits, lean cuts of meat, chicken, eggs, whole grains and dairy products instead of packed food items and use natural seasonings such as black pepper, chili flakes, dried herbs, spices, olive oil and homemade sauces instead of artificial flavorings and ready-made sauces to make you meals healthy and light and low-calorie. You can also opt for some fast cooking methods such as microwaving, stir frying, grilling and steaming that take less time compared to standard cooking methods and are much healthier as well. In this article, we bring to you 20 hand-picked meal and snacks recipes that you can prepare in 15 minutes or less. For most people, South Indian cuisine means dosa, idli and sambar. But these three items are just a minute part of the vast South Indian cuisine that includes colorful and delicious recipes from Andhra Pradesh, Telengana, Karnataka, Kerala and Tamil Nadu. Rice, vegetables and lentils form the base of South Indian cuisine and these ingredients are used in various forms – rice dishes, curries, dal, Rasam and chutney. Pickles, pappadams and yogurt or curd are served as side dishes with meals. Both curd and pickles are a rich source of healthy microorganisms that supports gut health and improve digestion. The distinct flavors of South Indian cuisine comes from the whole spices – mustard seeds, dry red chilies, cumin, cardamom, cinnamon, nutmeg and curry leaves. These spices are frequently used for tampering the dal and curries. Most of us are not aware that these spices have important medicinal value. Most south Indian main course dishes and snacks are prepared with fermented rice and lentils which are great sources of easily digestible carbohydrates, vitamins, fiber and proteins. These foods help to fill you up with fewer calories. As for the calories, you can always limit the amount of oil or use coconut oil instead of regular cooking oil to enhance the health quotient of the curries and dals. 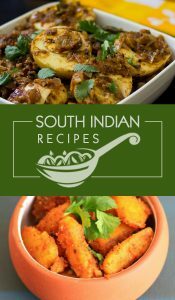 So, let us check out some of the most popular and easy South Indian recipes that you can prepare in a jiffy. Pizza is one of the most popular fast food items all over the world and it has its origin in Italy. Pizza is basically a flatbread prepared with all-purpose flour or whole-wheat flour, topped with tomato sauce, cheese and other selection of toppings – meat, vegetables and condiments and baked in an oven. The different types of cheese used in pizza acts as a great source of calcium that improves bone strength. The lean meats and vegetables used in the toppings supply muscle building proteins, antioxidants and fiber to the body and the whole grain crust supplies some healthy complex carbs to the body. As for making a perfect pizza, the secret lies in the perfect balance of cheese, sauce, toppings and crust. 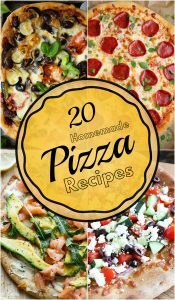 Whether you like it thin crust or soft and fluffy, here is a list of 20 easy homemade pizza recipes that you can try in your kitchen. Noodles are a staple food in Asian cuisine and a widely popular dish all over the world. It is prepared from dough of rice or wheat that are stretched or rolled flat and cut into variety of shapes and lengths. Noodles are a versatile food that can be cooked in a number of ways – boiled, pan-fired, deep-fired, soup, etc. Traditional noodles are made from wheat flour, buckwheat flour, rice flour and different types of starches such as sweet potato starch, mung bean starch, etc. Noodles are low in calories and packed with carbohydrates, fiber and protein along with minerals zinc and iron – all of which work together to establish a dietary balance. Being a versatile food, noodles can be prepared in combination with different types of vegetables, meat, fish and seafood to enhance its taste of nutritional value. Rice noodles, the most common variety of Asian noodles are naturally gluten-free, which makes them easy to digest and suitable for people with gluten-sensitivity or celiac disease. Usually Chinese street foods such as noodles are loaded with spices and oil, but when you prepare them at home, you can always adjust the amount of spices and oil to make it healthier without sacrificing on the taste. 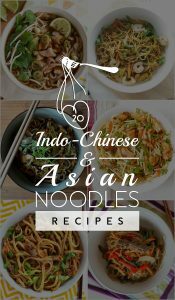 In this article, we have brought you a collection of hand-picked Asian and Indo-Chinese Noodles recipes that can be served as healthy snacks or complete meals. It does not matter whether it is bright and sunny, cloudy and drizzling or dark and freezing, hearty and wholesome soups are suitable for all the seasons. Soups are easy and convenient one pot meals where you can throw in a variety of ingredients including fresh vegetables, leafy greens, meats, fish and spices and create a wholesome dish that can be served as a snack or as a lunch or dinner. Soups are a great way to use up left over vegetables, meat and lentils. Starting a meal with a soup also helps to fill you up with a water and fiber combination that prevents you from over-eating the high-calorie foods served later in the meal. The best thing about soups is that they require very less spices and oil and they are prepared with fresh ingredients that make them light, low calorie and packed with nutrients. The high water content in soups make it a filling food that helps to increase satiety without adding too many calories, which in turn helps in weight management and promoting weight loss. 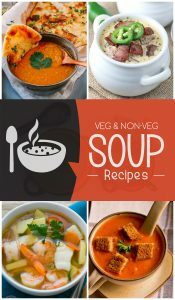 In this article, we have listed not one, but twenty easy and delicious homemade soup recipes from around the world. Chutney is a quintessential side dish in Indian cuisine that gives a pleasant jolt to your taste buds and scores big with almost all types of snacks and meals. The aromatic, tangy, savory and sweet taste of the chutney enhances the flavors and turns even a boring dish into a delicacy. Chutney can be prepared with a whole range of ingredients such as herbs, vegetables, spices, raisins and fruits. Some of the common ingredients used to prepare chutney are coconut, mango, tamarind, ginger, garlic, coriander, mint, peanut, chilies and tomato. Chutney is marked for its distinct tangy-sweet taste that works as an appetizer and helps to promote appetite and support digestion. The combination of spices, salt, oils and acidic ingredients used to prepare chutney preserve the main ingredient and increase its shelf life. So, you can prepare a batch during the weekends and serve it throughout the week. In this article, we bring to you 20 of the most popular and easy Indian chutney recipes that you can serve with snacks and breakfast. Biryani is one of the most popular Indian rice dishes loved by young and old alike. The origin of biryani dates back to the Mughal era where this dish was prepared specially for the soldiers. Over time, the recipe has evolved and at present we find many variations of the biryani that is influenced by the different regional style. But, there are two main ways of cooking biryani – the first one is the original Dum Biryani in which the rice and the meat is slow cooked in steam , the second one is a more recent version in which the rice and vegetables are cooked separately and then mixed together in a skillet. The authentic flavor of the biryani comes from the blend of fragrant basmati rice, saffron and whole spices. From the convenience point of view, biryani is a wholesome and delicious one-pot meal that can be served alone or just with some raita, curd or salad, it does not require any side dish or curry. So, in a way it is a time-saving and interesting lunch/dinner option that is loved by kids and adults. And when it comes to the healthful aspects of biryani, white basmati rice used in this dish is a gluten-free carbohydrate that is easy to digest and is suitable for people with digestive disorders and celiac diseases. Biryani is an exceptionally versatile dish and you can always make it healthier by reducing the amount of spices and oil and incorporating more vegetables into it. So, let us take a look at some easy and delicious vegetarian and non-vegetarian biryani recipes that you can try in your home. No meal is complete without a dessert and when it comes to Indians, we have a special connection with out sweet dishes. 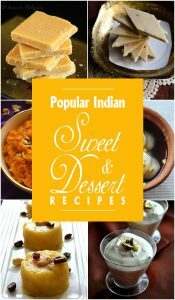 Desserts and sweets hold an important place in Indian Cuisine. Desserts are included in the meal, it forms a part of snacks and it is served as an offering to Gods in the form of Prasadam. Sweets and desserts also play a crucial role in each and every festival – Holi, Diwali, Navratri and Wedding ceremonies where it is served to guests as a token of love and friendship. A majority of Indian sweets and desserts are prepared using three main ingredients – milk, sugar and khoya. Other common ingredients include ghee, nuts, jaggery, coconut, wheat flour, etc. In this article, we bring to you some of the popular and easy Indian sweets and dessert recipes that you can prepare in your home.